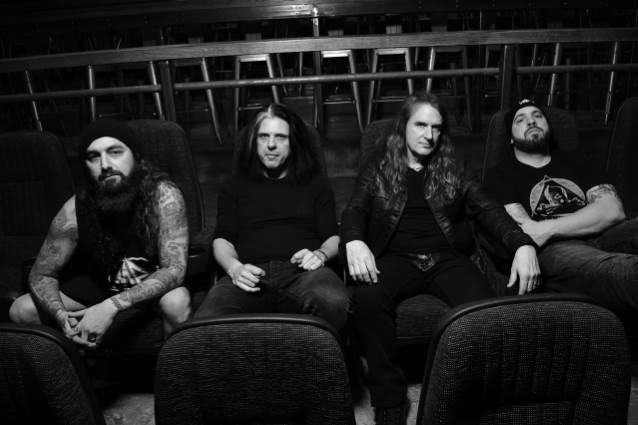 METAL ALLEGIANCE — with its four core members: David Ellefson (MEGADETH), Alex Skolnick (TESTAMENT), Mike Portnoy (THE WINERY DOGS, ex-DREAM THEATER) and Mark Menghi — began as a celebration of heavy metal, powered by the almost tribal bond shared between the extreme music community's most revered trailblazers, armed with a list of contributors onstage (and off) that read like a Wikipedia entry on the genre itself. The band will release its sophomore album, "Volume II - Power Drunk Majesty", on September 7 via Nuclear Blast Entertainment. The thrash-worshiping disc merges old-school legends with the modern metallers of the scene to produce groove-driven, adrenaline-soaked anthems while tackling the frustrating state of the world. A new trailer for "Volume II - Power Drunk Majesty" in which Portnoy chats about drumming on the album can be seen below. 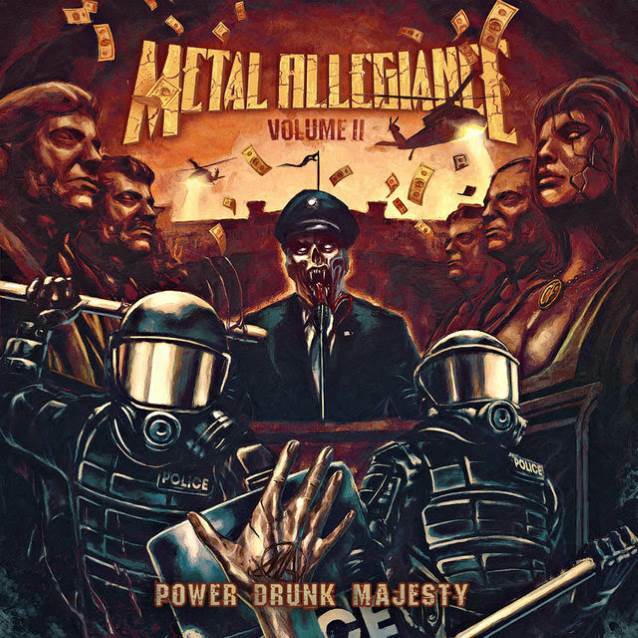 Guest musicians on "Volume II - Power Drunk Majesty" include Max Cavalera (SOULFLY, SEPULTURA, CAVALERA CONSPIRACY), Trevor Strnad (THE BLACK DAHLIA MURDER), John Bush (ARMORED SAINT), Bobby "Blitz" Ellsworth (OVERKILL), Mark Tornillo (ACCEPT), Floor Jansen (NIGHTWISH) and Johan Hegg (AMON). 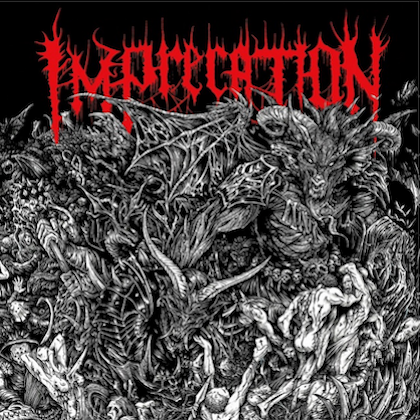 The album also marks the return of Mark Oseguesda (DEATH ANGEL) and Troy Sanders (MASTODON). The official video for the first single from the disc, "Mother Of Sin", featuring Ellsworth, can be seen below. "Volume II - Power Drunk Majesty" was produced by Menghi and Skolnick while Mark Lewis of MRL Studios handled the mixing and mastering. 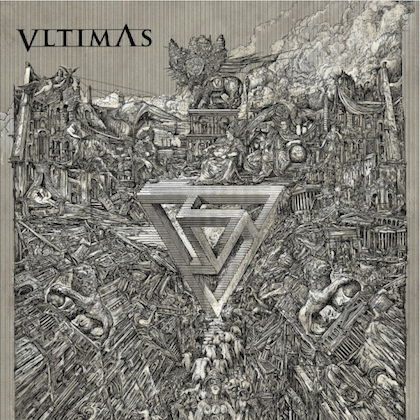 The cover artwork was created by renowned artist Marcelo Vasco (SLAYER, MACHINE HEAD, SOULFLY, HATEBREED) and Rafael Tavares.